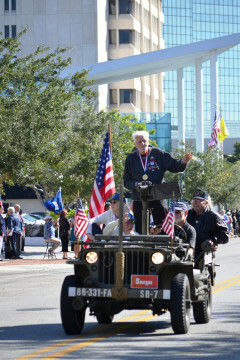 The City of Sarasota, in conjunction with the Sarasota Patriotic Observance Committee, will co-host the annual Veterans Day Parade on Sunday, Nov. 11, at 10 a.m. in downtown Sarasota, the Sarasota Police Department is reminding the public. 8 a.m. to 12:30 p.m.: Main Street closed from U.S. 301 to Mira Mar Court. 8 a.m. to 1 p.m.: Central Avenue closed from Main Street to First Street. Vehicles not removed by the posted time will be towed at the owner’s expense, the release stresses. For information on towed vehicles, the release adds, the public may contact Upman’s Towing at 365-7084.